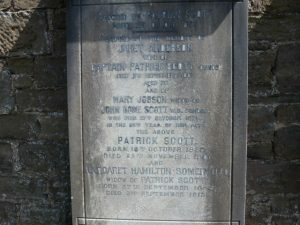 At the time of her death, Mrs Captain Scott (Janet Anderson), was an extremely wealthy woman. She used her wealth to the benefits of many local institutions and her charitable benevolence was well documented within the local press of Dundee. 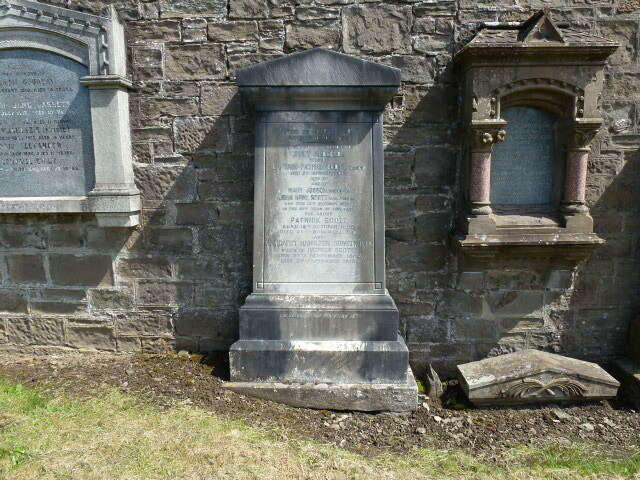 Western Cemetery, Perth Road, Dundee - Memorial stone erected in the memories of Captain and Mrs Scott by her cousin's son, also named Patrick Scott - family plot, lair number 20,c,d,j,k. Listed under Patrick Scott. Free Church - Mrs Captain Scott had an association with Free St John's in Small's Wynd, for which she made provision in her will (in the form of an endowment) for the Church, its buildings and school. 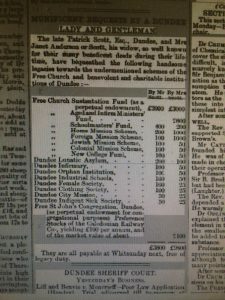 Captain and Mrs Scott left large sums to the Free Church Sustentation Fund as a perpetual endowment and also to various schemes within the Church. Captain Scott left the Sustentation fund £2000 while Mrs Scott gifted £3000. Mrs Captain Scott showed remarkable benevolence to the following Societies - Dundee Industrial School: Dundee Flower Mission to the Sick Poor: Dundee Lunatic Asylum: Dundee Infirmary: Dundee Orphan Institution: Dundee Female Society: Dundee Clothing Society: Dundee City Mission: Dundee Indigent Sick Society: She donated to all of the above and also to the Free Church schemes a total of £9800 (also £3800 from Mr Scott). Mrs Captain Scott (born Janet Anderson, daughter of Ebenezer Anderson – merchant and banker, and Janet Scott) married Captain Patrick Scott in 1811. She was 25 years his junior. At the time of Patrick Scott’s death in 1855, he was declared a ‘gentleman’ and had reached the grand age of 90 years. A native of St Andrews, he had lived in Dundee for 46 years, and for two years prior to his marriage to Janet Anderson. According to Janet’s death record, her husband had been a shipmaster for HEICS (Honourable East India Company Service). The 1851 census lists him as a retired ‘mariner’. Captain and Mrs Scott lived for over 40 years in the Nethergate and, for at least 30 of those years, at 160 Nethergate (the site currently occupied by the Queen’s Hotel). Interestingly, their property would have been bounded by the old seawall, still currently ‘B listed.’ It was declared in Janet’s will that monies were due to her estate for a ‘claim against the Caledonian Railway Company for value of solum and for compensation for injury to remaining property – amount not yet adjusted and cannot in the meantime be estimated.‘ This indicates that her property occupied a site extending from the Nethergate, South to the river – part of which was subsequently taken up by the railway. 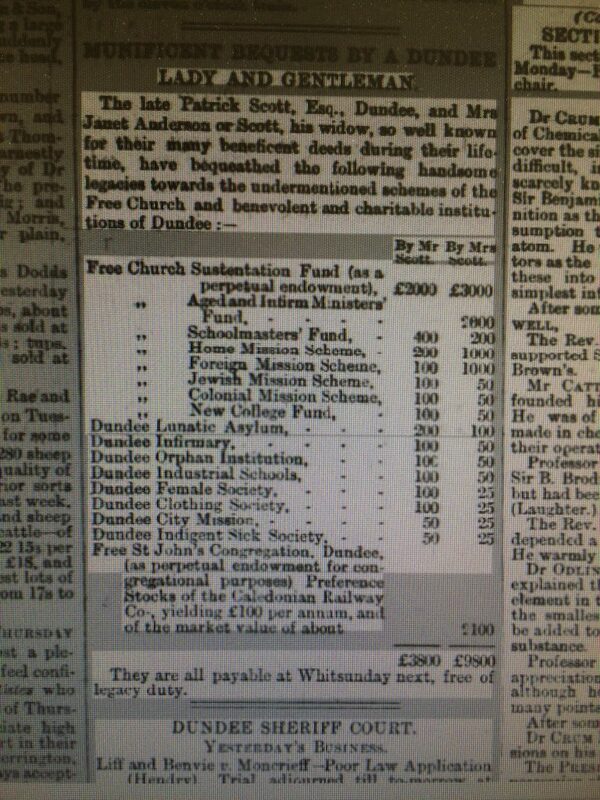 Captain and Mrs Scott were heavily involved with the Free Church and in charitable endeavours throughout Dundee. The information above about Janet Scott has been collated from a range of digital and hard copy sources. To the best of our knowledge it is correct but if you are relying on any information from our website for the purpose of your own research we would advise you to follow up the sources to your own satisfaction. If you are aware of an inaccuracy in our text please do not hesitate to notify us through our Contact page.